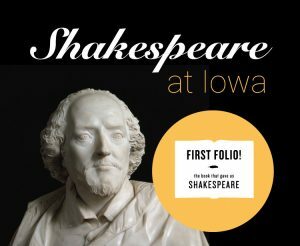 The University of Iowa Libraries will play host to a copy of Shakespeare’s First Folio August 29-September 25. The Folio and accompanying exhibit, featuring items from the Folger Library and University of Iowa Special Collections, will be housed in the Libraries’ Gallery (located on the first floor near the north entrance). The Grand Opening event will take place on August 29th at 10am in the North Lobby of the Main Library. A series of noontime recitals will take place throughout the month of September featuring music from the era of Shakespeare or compositions inspired by the Bard. Come hear some great music and while viewing this cultural treasure! Welcome to the new Rita Benton Music Library!